While Ott DeFoe’s boat got the headlines for getting him to unpressured water, it was his jig that got him the bites to win last week’s Bassmaster Northern Open tournament on Tennessee’s Douglas Lake. DeFoe flipped a half-ounce, black-and-blue Terminator Pro Series Jig to catch most of the fish he weighed, including his biggest, a 4 ½ pounder. 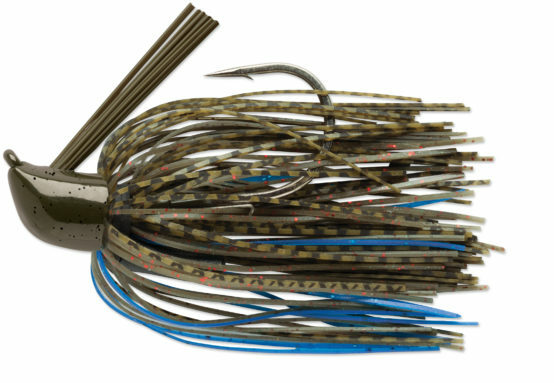 Featuring a unique head design, the Pro Series Jig is much more versatile than most jigs. Custom jig-skirt colors, color-matched brush guards, a single rattle and a heavy VMC® Black Nickel hook further differentiate it from other cookie-cutter jigs that all pretty much look the same. They’re available in five sizes: ¼ oz, 3/8 oz, ½ oz, ¾ oz and 1 oz. Although DeFoe started the tournament flipping a ¾-ounce jig, he soon decided it was too heavy, sticking to the bottom “like an anchor.” So he switched to a half-ounce jig. 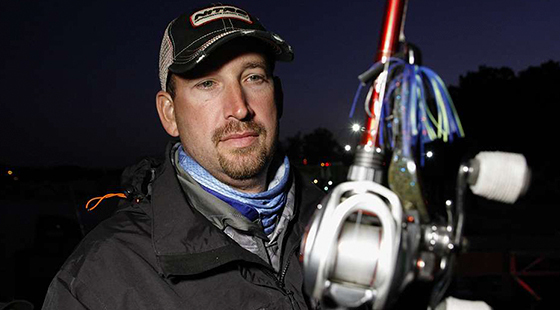 “In a river situation you want the current to move your bait a little bit,” he explained. Because a recent rain had muddied up the water, DeFoe chose a black-and-blue color pattern for his jig, which he dressed with a green pumpkin/blue flake chunk-style trailer. DeFoe weighed in a 15-pound, 9-ounce five-bass limit on the three-day tournament’s final day to finish with 50 pounds, 3 ounces and win by more than ten pounds. All of his fish throughout the tournament came from 1 to 3 feet of water. DeFoe previously won a Bassmaster Northern Open in 2014 on Douglas Lake, which is located just up the road from where he lives north of Knoxville. This entry was posted in Pro Staff, Terminator and tagged Ott DeFoe, Pro Jig, Terminator, VMC. Bookmark the permalink.